I love poached eggs overall, but this particular Italian way of making and serving them was a great finding for me. I learned it in London from Katie Caldesi and since then I keep making it as a breakfast, appetizer, light lunch or dinner. Somehow the tomato sauce complements the egg really well and brings is up to a balanced meal. 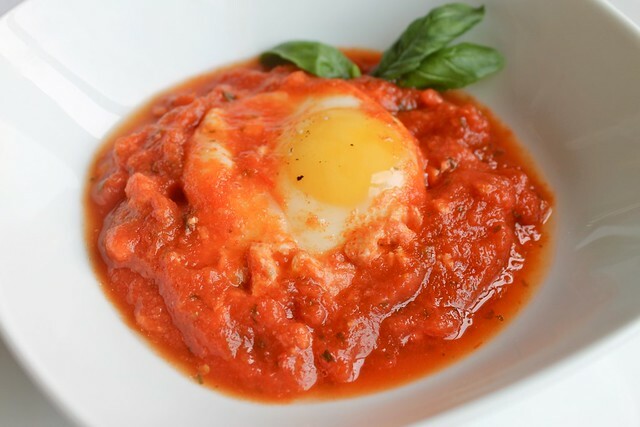 Moreover, poaching an egg in tomato sauce doesn't involve any stress associated with poaching eggs in water. I don't know why, but the name for this dish is Babbo's eggs (le ouva del babbo). It belongs to homey Tuscan cooking. You bring some good Italian tomato sauce to a boil, gently break the eggs in (trying to keep the yolks whole) and cook until the whites are done and the yolks are still liquid. As the tomato sauce is thick and sour it allows each egg to hold well together and not go all over the place. It is very much unlike poaching in water, where you have to think of different tricks to make the eggs hold. Once the eggs are done, you serve them in soup bowls or large cappuccino cups together with the tomato sauce. One egg per person can make a nice breakfast or appetizer. Two eggs per person make a light lunch or dinner. If you do have some good Italian tomato sauce ready, making the dish will take you some 5-7 minutes. However if you don't, it still won't take you long. Making Italian tomato sauce is quite easy (the recipe follows below) and it normally makes sense to make more than you need right away. It always turns out very useful to have some in your fridge. Pour the sauce into a wide frying pan and bring to a boil. Gently break the eggs into the sauce trying not to break the yolks and keeping them separate. Season each egg with salt and pepper. Cook under lid on medium heat for 5 - 7 minutes until the whites are set. Ladle each egg with some tomato sauce into serving bowls or large cappuccino cups and serve hot. Note: Alternatively you can cook the eggs individually. Ladle the sauce into individual ramekins, break an egg into each and bake at 180C for 10 - 12 minutes. Heat the oil in a pan. Add the onion and garlic, season with salt and pepper. Cook on medium heat, stirring occasionally till the onion is soft and translucent. Don't rush at this step. You have to cook the onion long enough to get the sweetness out of it (this makes the sauce taste much better). Add the tomatoes and break them up using a potato masher or scissors. Bring to a boil and cook on low heat for 20 minutes. Remove from heat and mix in the basil. Taste and adjust the seasoning. Use as it is or blend if you wish the sauce to have even texture. Keeps in an airtight container in the fridge for several days. What a great dish for breakfast! I love poached eggs as well. The funny thing is, once I came across a similar recipe but it was not an Italian but a Georgian one! It was suggested to serve it with Georgian bread lavash and I loved the combination a lot! Wonderful! From some of the comments on livejornal I found that the dish is incredibly international. Local versions are cooked in Israel, Spain, Turkey etc. Now thanks to you, Georgia also joins the list. Amazing that I never knew this before! In Turkey they eat something similar like this.